YOU couldn’t really get two contrasting Wembley days: the FA Cup final, full of rabid supporters, followed by the low-key, low-octane event that is Non-League Finals Day. The latter has more in keeping with cricket or rugby in terms of the audience, but after experiencing 88,000 people struggling in and out of Wembley, the relative calm of the non-league showpiece was very welcoming. For the fans of clubs like Stockton and Thatcham, who kicked-off the day, playing at Wembley was almost surreal. Thatcham won the Hellenic League on goal difference after ending up level on points with Bracknell – 129-25 versus 129-27. They normally attracted 133 fans to their league games and even if everyone from the Berkshire town turned up at the final, it would amount to just 26,000 people. Their opponents, Stockton, finished sixth in the Northern League but beat eventual champions Marske in the semi-final. Their average gate in 2017-18 was 222. 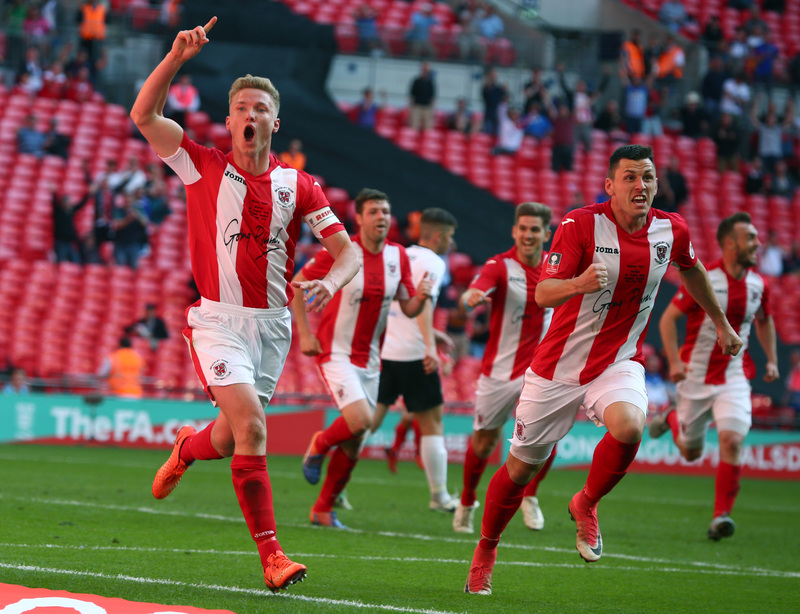 The Northern League has dominated the FA Vase for the past decade, so many assumed Stockton would lift the trophy in 2017-18. However, they were up against a strong, fast and robust Thatcham team. Stockton could have opened the scoring early on, but the decisive goal came from the penalty spot after 23 minutes. The scorer was Thatcham’s Shane Cooper-Clark, who had scored an extraordinary 60 goals before the Vase final. He didn’t take his kick too well, though, and Stockton keeper Michael Arthur almost saved the effort. Thatcham hit the woodwork in the second half, but Stockton rarely looked like they were going to save the day. The Hellenic League side deserved their victory, leaving Stockton’s fans with a very long journey home to reflect on what might have been. As for the crowd, they had a couple of hours to kill before the next item on the agenda, the FA Trophy final between Brackley Town and Bromley. Wembley tried to make the wait bearable by putting on Real Ale bars and a spot of music, the Brass Funkeys, a London-based New Orleans-style band, certainly made the afternoon more pleasant. By this time, Brackley and Bromley fans had started to arrive – interestingly, the non-league finals day has yet to capture the attention of the neutral, although there were fans from other clubs present. Three years into the arrangement, the event has not yet attained the status of FA Amateur Cup finals when the non-league community would back the occasion. The crowd for the 2017-18 day was 31,403 – the lowest since the two finals were held on the same day. In 2015-16 it was 46,781 and 2016-17 38,224. Has the concept peaked already, one might ask? Not at all, the appeal of the finals depends on the potential audience that each club can bring to the stadium. In 2016, the combined average gates for the four finalists was 8,997 – the final gate was 46,781 which represented just over five times the combined averages. In 2016-17, the multiple was seven and this season, it was 14. The finalists’ combined average this season was 2,219 – considerably lower than past non-league finals days. So, Wembley need not worry. The FA Trophy final was, understandably, a better quality game in terms of technique, but the first period was dull, with Bromley taking the lead through Omar Bugiel. Brackley, who looked half a yard slower, woke up dramatically in the second half. They pressured Bromley throughout and wasted a number of good chances. The neutral, at this stage, was cheering on Brackley and in added time, they scored a mess of a goal, the ball hitting the post and being turned home by a combination of a defender and Brackley’s Gareth Dean. And so, extra time featuring two tired teams and a penalty shoot-out that eventually swung Brackley’s way. Frankly, they earned it. At just £ 25, Non-League Finals Day is one of those rare moments in football where you feel you’ve had value for money. A great afternoon out for the non-league fan and, generally, a good spirit (although the Brackley fan who berated two young girls, who then walked out very upset needs a good talking to). It’s time that more people discovered it, Wembley only has real atmosphere when it’s almost full. I wonder how many neutrals are put off by having to stay inside the stadium for a couple of hours between games. It’s a long wait if the Vase final ends after the regular 90 minutes.